The king was very anxious to know the answers to these questions. One day, he went to the forest and was moving about the hills and plains. He saw an ashram (hermitage) and wanted to take some rest there. 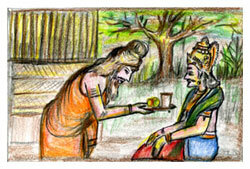 By the time the king reached the ashram, a hermit was watering some plants. The hermit saw that the king was rather tired, stopped watering the plants, ran up to the king and gave him some fruits and cool water. 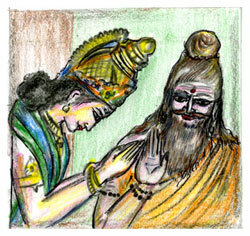 At that time, a man was brought to the ashram by another hermit with wounds all over his body. As soon as the hermit saw this, he went to the man, cleaned his wounds and gave him some herbs which would cure the wounds. He was also speaking sweet words to console him. The king then wanted to express his gratitude and take leave of him. The hermit blessed the king, but the king was still troubled by his three questions and wished to see if the hermit could enlighten him. The hermit stated that the answers to the three questions were contained in the actions which the king had witnessed in the ashram. 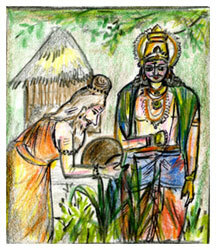 The hermit said that when the king came to the ashram he was watering the plants and that was his duty. On seeing the king the hermit had given up his duty and had come to the king, giving him fruit and water. This was in accordance with correct traditions, as the king was his guest. While relieving the king of his thirst and suffering, another injured individual had come to the ashram and therefore the hermit had given up the duty of serving the king and had gone to the other man and had begun to serve him. Whoever comes seeking service from you is the best individual at that time. Whatever satisfaction you can give him by serving him will be the best work you can do. The present, when you can do something, is the most sacred of all times.